So I’m dealing with a split fashion personality. There’s the adult, classy, put-together style, and there’s the hipster, boho, just-rolled-out-of-bed look and I love both of them. I see this everywhere, on everyone. I still wonder how people get their jeans to be so smoothly tucked – but that’s beside the point. Here’s another look. Very simple pieces, understated colors, black. From the Loeffler Randall fall 2009 lookbook. The always lovely Rachel Bilson. I don’t exactly think there’s anything special about the outfit, but she looks chic and classy. Again, simple pieces, muted colors (except for the shoes, which are a nice addition) very nice. 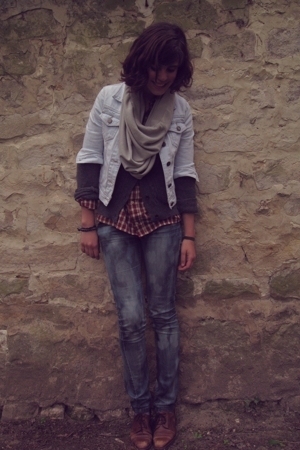 And here’s Adeline_R – a Chictopia user. Great simple look, nice sweater/jacket, t-shirt with a cute pattern, nice skinny jeans… Nice jewelry too. Chictopia user ClassyTrash in a nice layered look, a good mix of textures too. Then there’s the hipster, disheveled look. I guess I hesitate on this one because attitude is so important and I’m afraid of looking like I’m a fake (to be perfectly honest). But regardless, I think these people look pretty cool. Dree Hemingway, simple, but still cool. The slouchy top(s) and the great skinny jeans.